This web page took ten to twelve hours to scan, research, design, and upload. Thank you for supporting the Virtual Steam Car Museum! Only 16 of these cars were built in 1922, an additional cheaper model being unsuccessfully added to the line a year later. 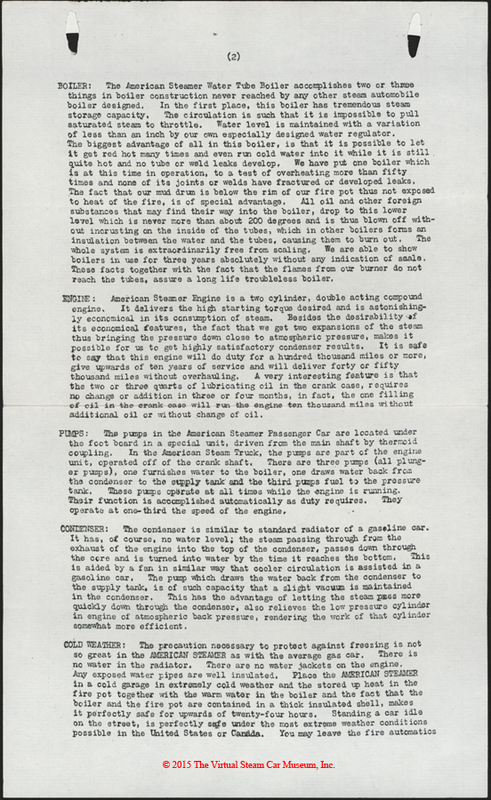 The Company's trade literature documents its research efforts as early as 1918 and touts decades of experience. In the summer of 1922, the Company sought and found manufacturing facilities in Elgin, IL and by year's end had moved into the factory. 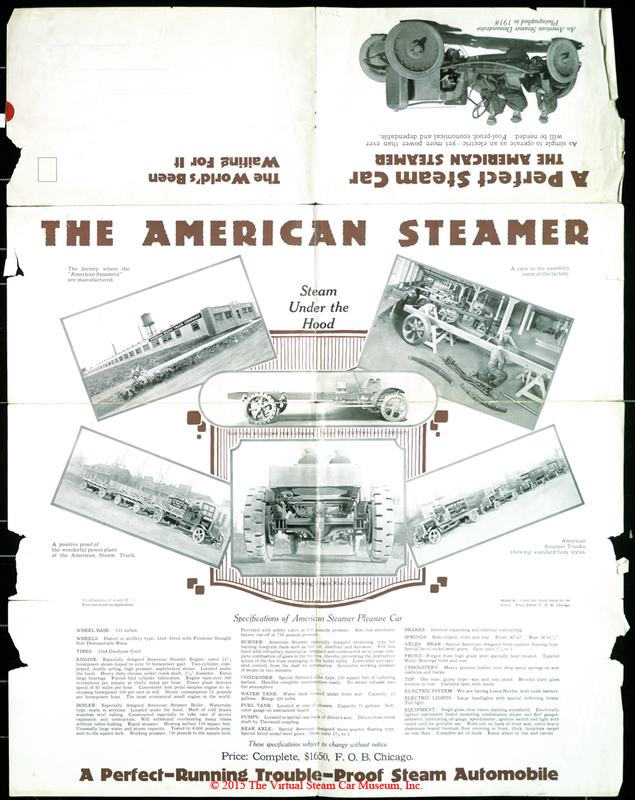 In late 1922, The Firm announced "The American Steamer" and published trade literature to promote it. By 1924, the company had apparently ceased production and gone out of business. Additional research will resolve unanswered questions. 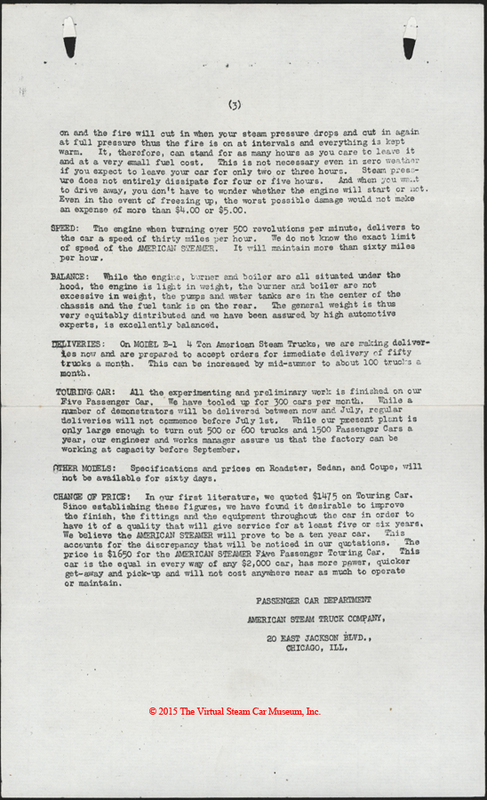 This large mailing piece folds out to reveal information on both the company's trucks and automobiles. It was accompanied by a three-page, poorly copied letter. (Immediately below.) It was likely the best the Company could afford. 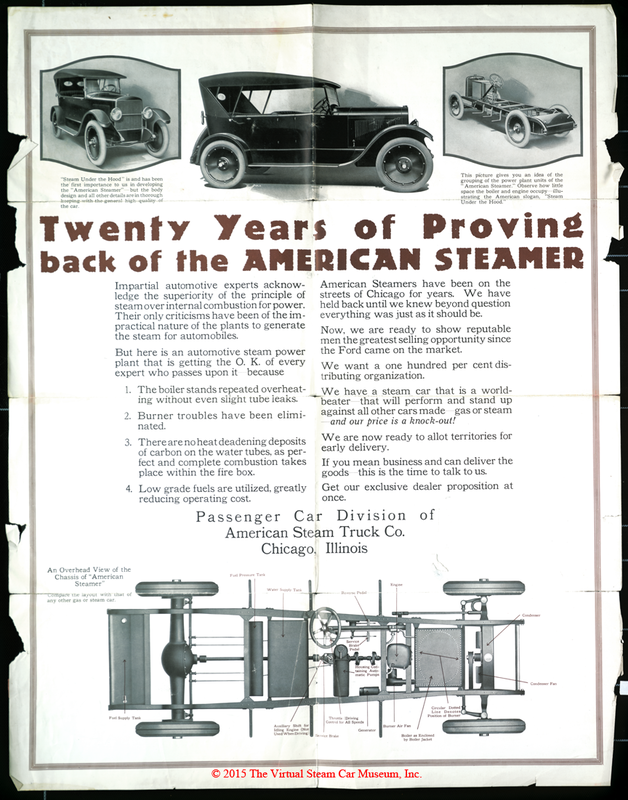 The image of "An American Steamer Demonstraotr Photgraphed in 1918" documents the Company's research efforts four years before bringing a car to market in 1922. 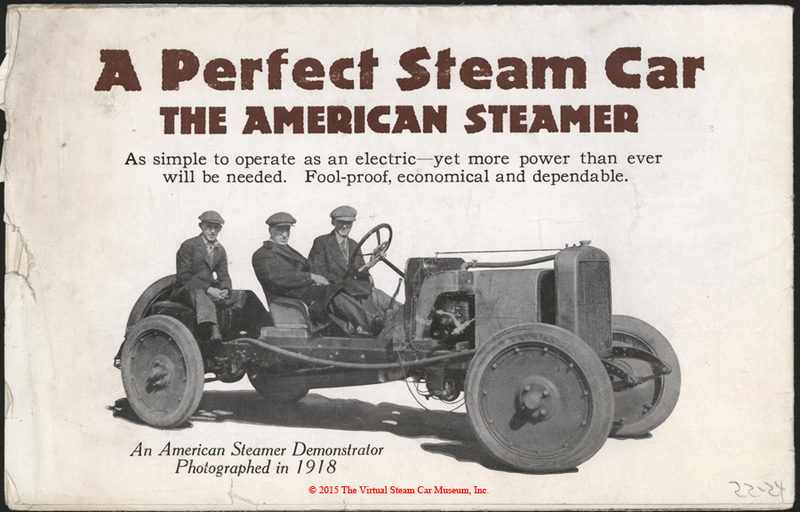 The Steam Automobile Club of America (SACA) has reprinted this brochure. Go to its web site to buy a copy. 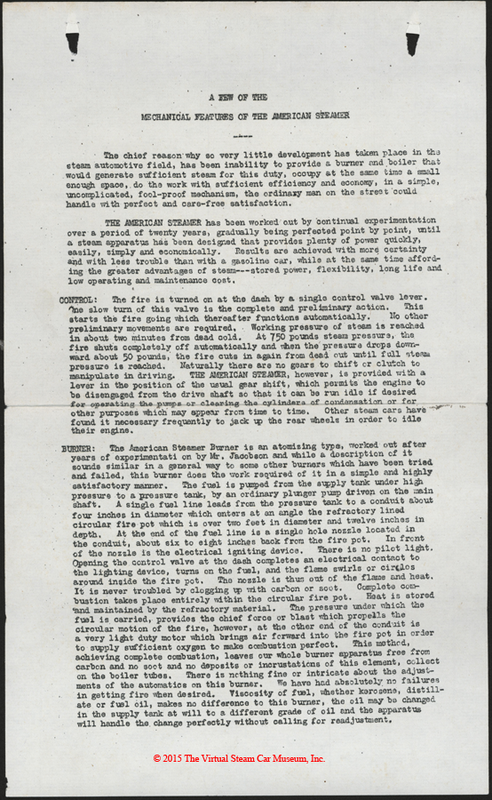 This undated three-page letter describes the American Steamer's technical features. Like the brochure it accompained (above), it probably dates from 1922 and may be a news release of some sort. Someone has typed the date 1922 on this trade catalogue. 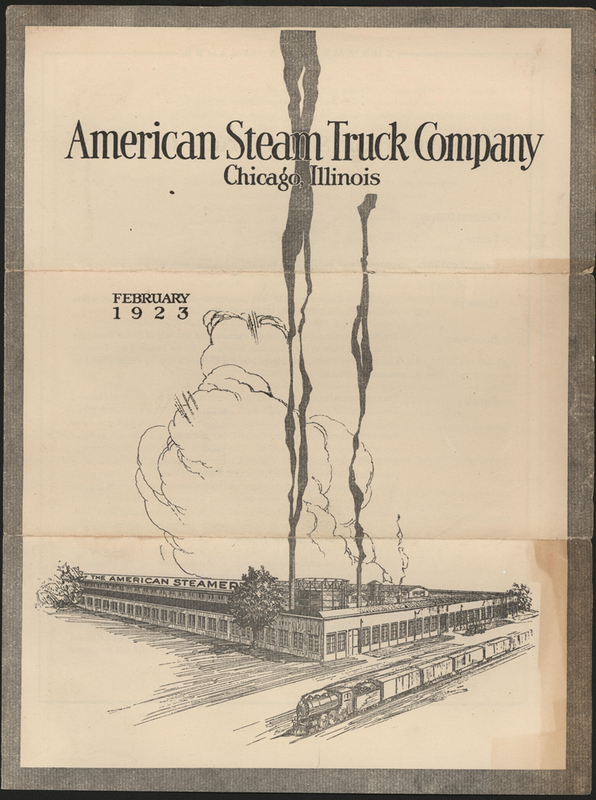 The American Steam Truck Company announced its "American Steamer" in October 1922, so this catalogue likely dates from late 1922. Under the tape are two file stamps, one reading "The Public Library Detroit Mich" and the other reading "Technology Department." A sticker beneath the tap reads "T.C. 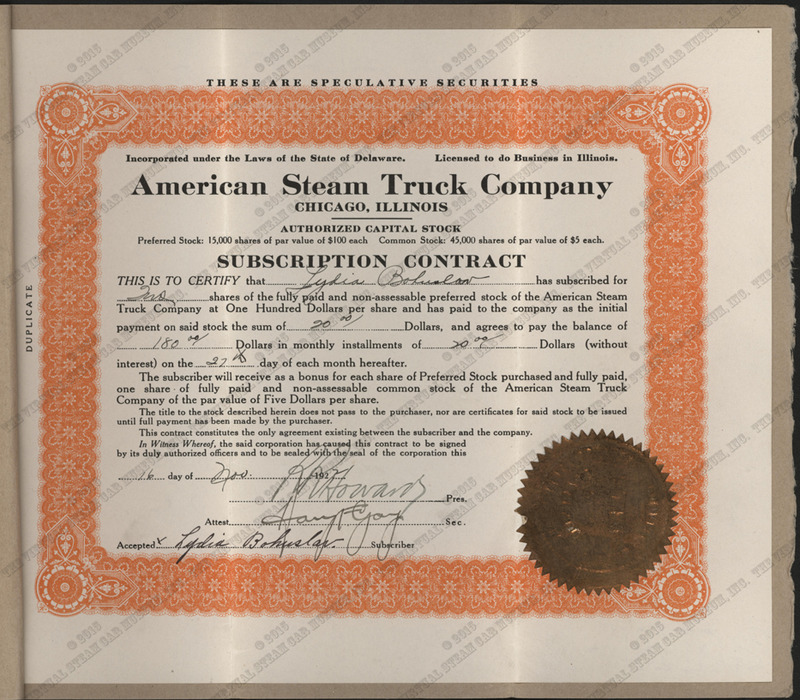 Automobiles, Steam, American Steam Truck Co." John A. Conde Collection. The photocopied trade catalogue at the left contains variations from the original catalogue above. John A. Conde Collection. On the right is the Steam Automobile Club of America reproductino brochure. You may purchase a copy at the SACA Bookstore. 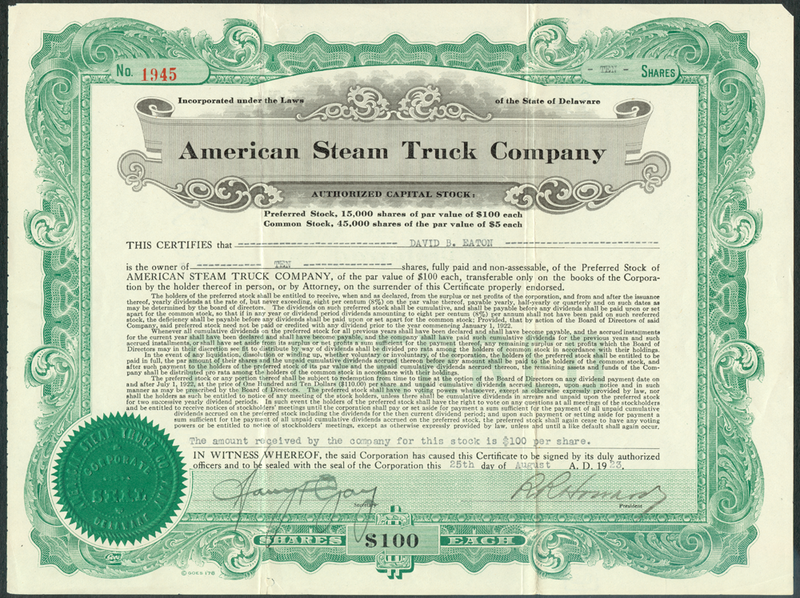 Motor World detailed the American Steam Truck Company's effort to find suitable manufacturing facilities on page 42 of its August 9, 1922 issue. John A. Conde Collection. 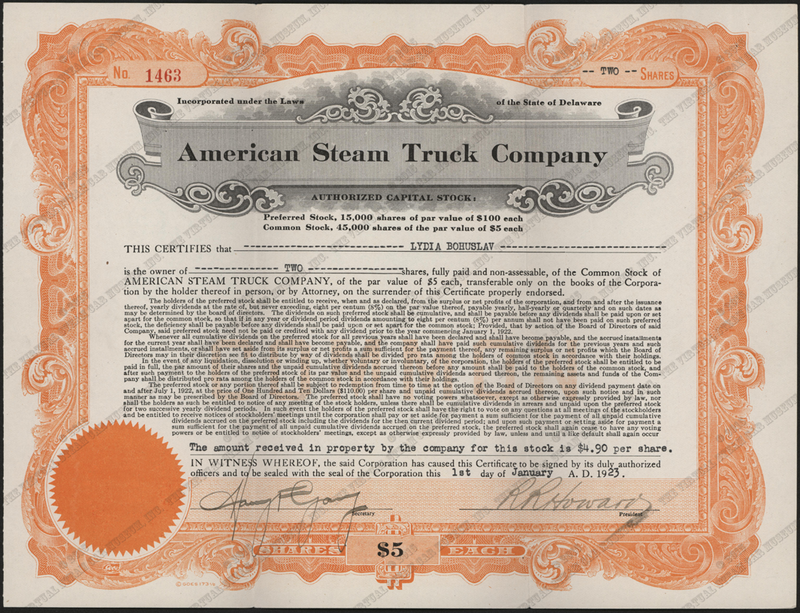 The American Steam Truck Company announced its five passenger touting car in October 1922. The American Automobile Digest carried this note on page 83 of its October 1922 issue. John A. Conde Collection. 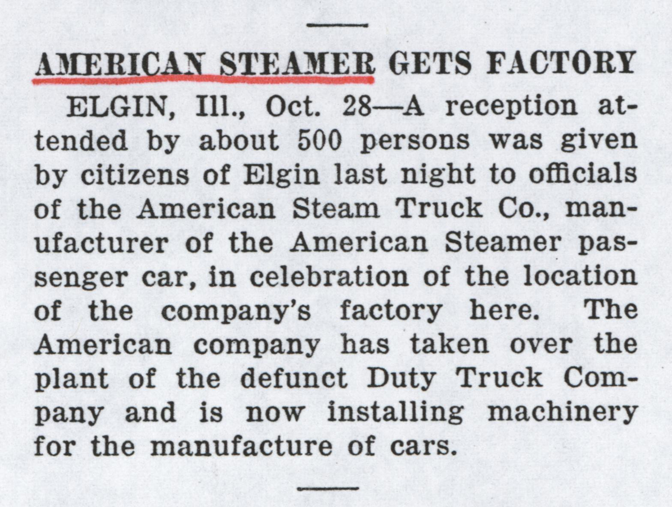 In October 1922, the American Steam Truck Company acquired Duty Truck Company factory in Elgin, IL, to the delight of some 500 Elginites. Motor Age reported the Company's progress on page 78 of its November 2, 1922 issue. John A. Conde Collection. 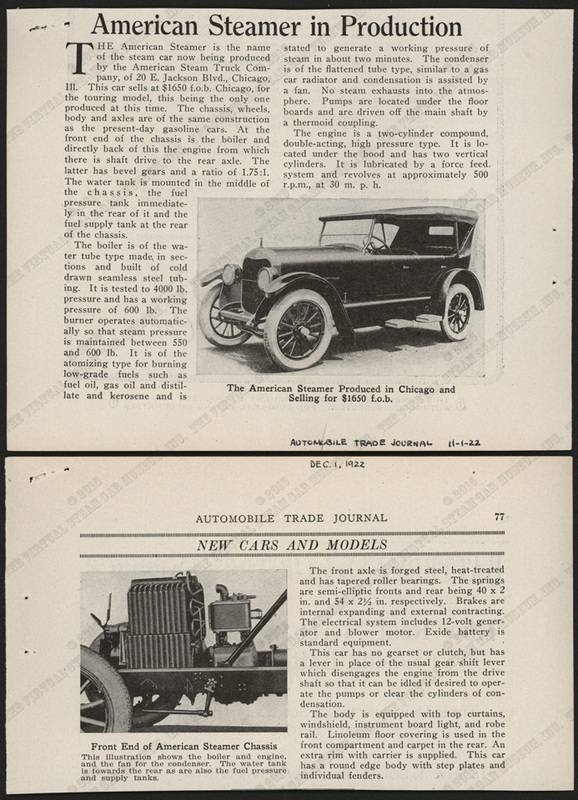 Automobile Trade Journal carried this two-page article in November 1922 announcing production of "The American Steamer." John A. Conde Collection. 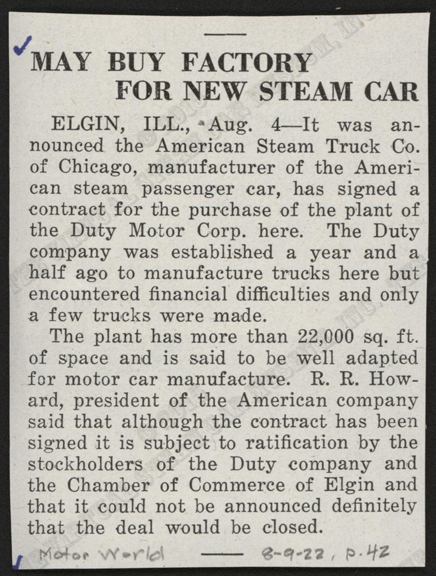 As reported in Motor Age for December 1922 (p. 60), the American Steam Truck Company had completed the acquisition of its Elgin, IL factory to produce "The American Steamer." John A. Conde Collection. 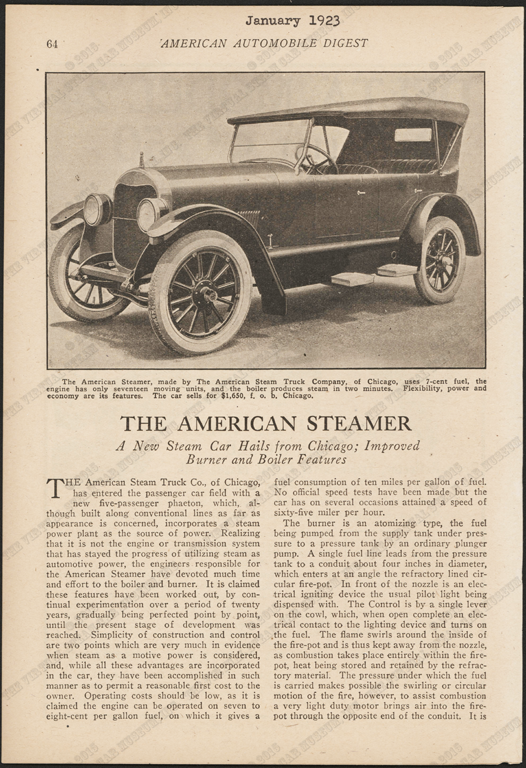 The American Automobile Digest published a four-page article extoling th3 American Steamer's technical features in January 1923, pp. 64 - 70. John A. Conde Collection. 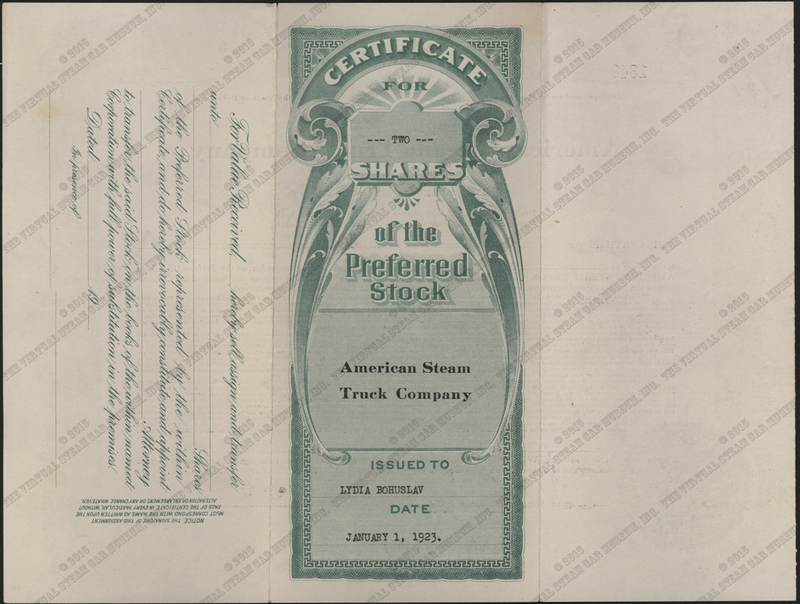 This February 1923 stock prospectus promoted the Company and its Elgin, IL factory. 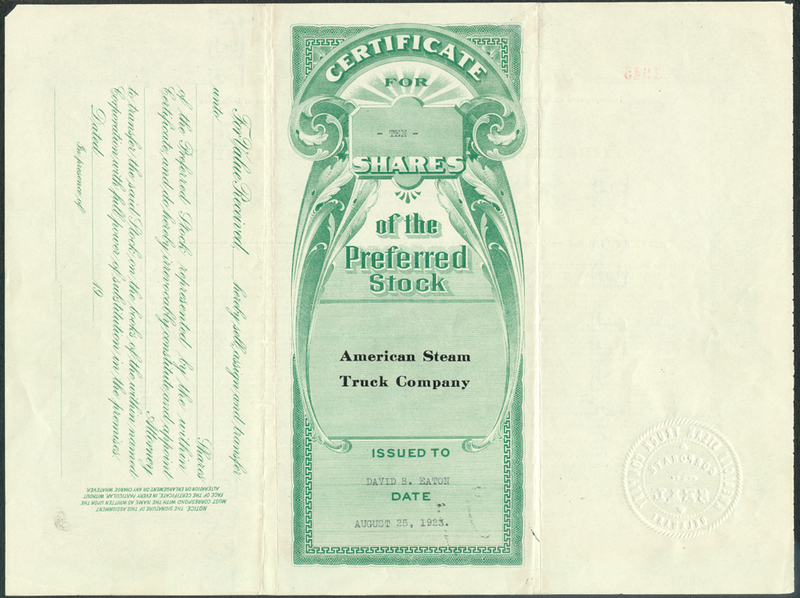 In November 1922, Lydia Bohuslav of Cicero, IL purchased two shares of American Steam Truck Company Preferred Shares and two Common Shares. Her subscription card, stock certificates, and Subscription Contract survive. 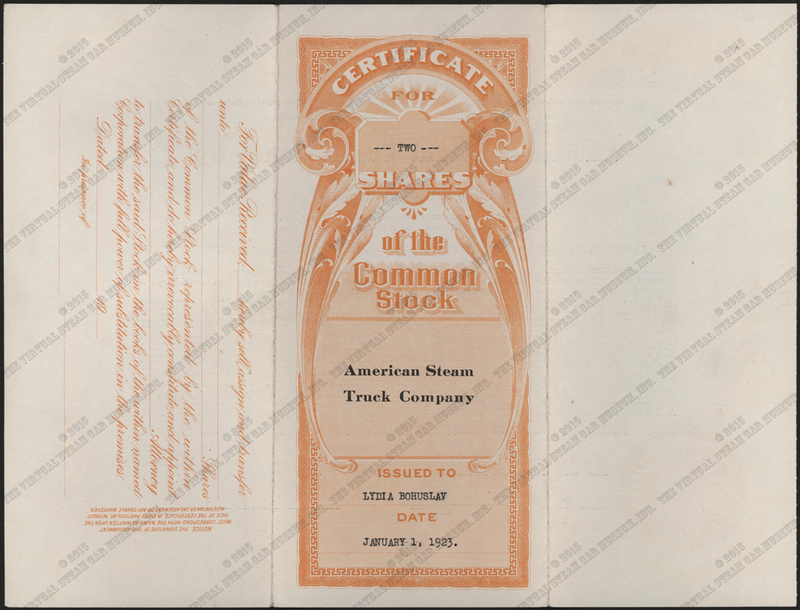 David B. Eaton bought ten shares of American Steam Truck Company stock for $100 each on August 23, 1923. He likely read the stock prospectus above. 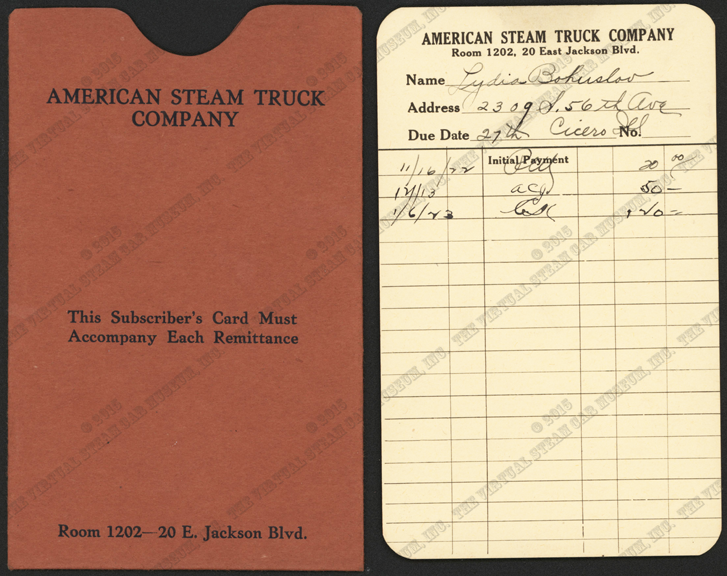 This empty advertising cover produced by the American Steam Truck Company is dated September 5, 1923. John A. Conde Collection. 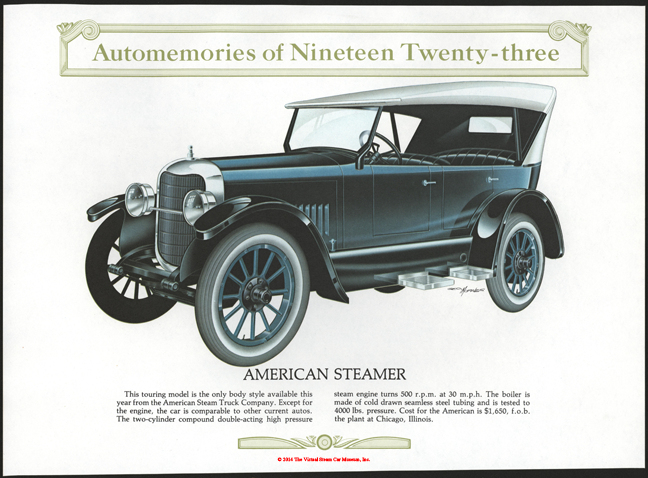 The artist, George Morales, created this image of a 1923 American Steam Truck Company automobile, for an Automemories calendar. This is the smaller version and measures 7" wide by 5 1/2" high. 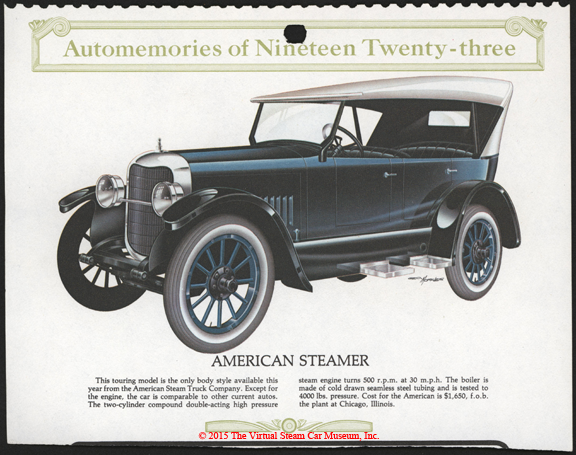 The artist, George Morales, created this image of a 1923 American Steam Truck Company automobile, for an Automemories calendar. This identical image is 14" wide and 10" high, apparently for a larger calendar. 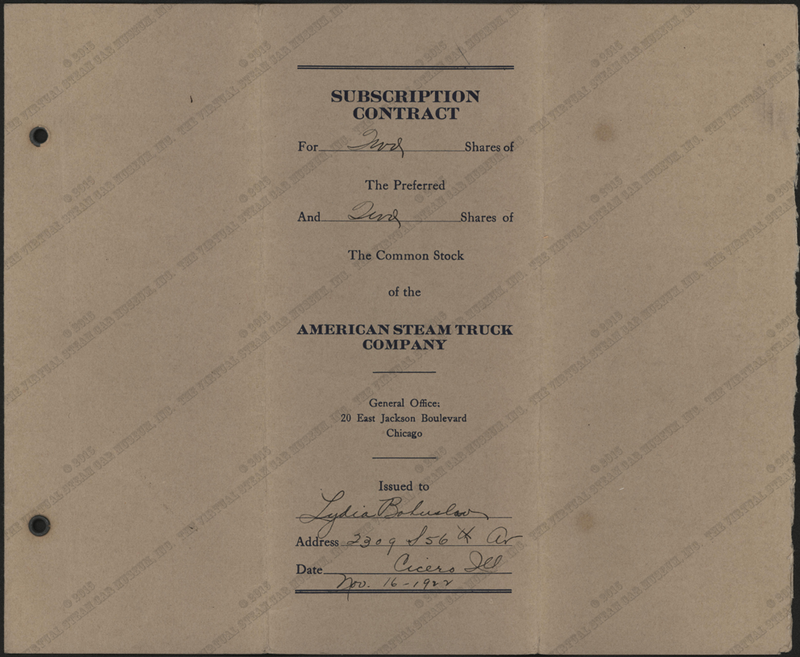 John A. Conde's American Steam truck Company File Folder. John A. Conde Collection. Georgano, G. N., Encyclopedia of American Automobiles, (New York, E. P. Dutton & Co., 1968), p. 18. Conde stapeled these two pages together, but dated them a month apart, November and december 1922. Someday the author will sort this out. 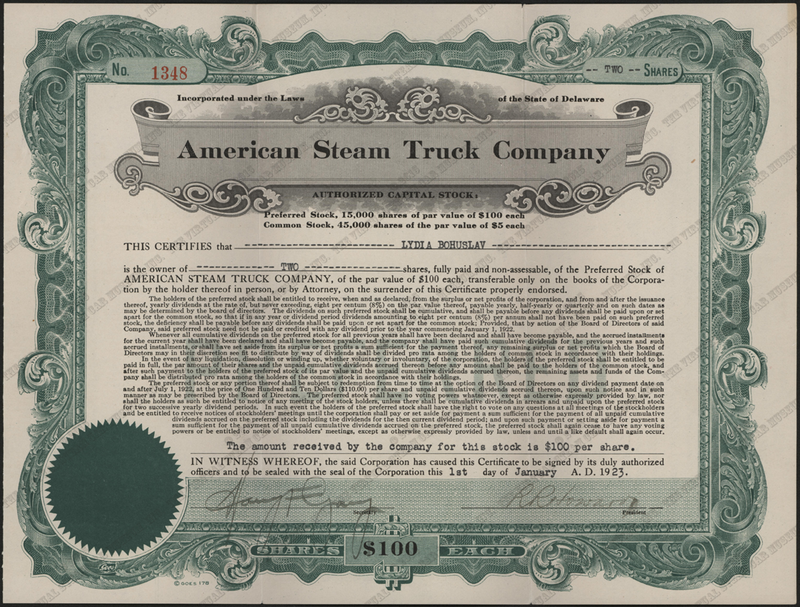 Contact us if you have additional information about the American Steam Truck Company, or if you have questions.